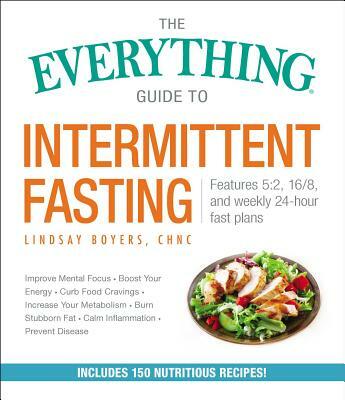 Learn all about intermittent fasting with this comprehensive guide—from its health benefits to how to safely implement fasting into your life and diet—with 100 recipes for nutrient dense foods and meals under 500 calories. Intermittent fasting involves alternating cycles of fasting and eating, all within a set time schedule. Think of it more as a pattern of living and eating than a diet. Because unlike diets, there aren’t any strict rules on what you can and can’t eat—intermittent fasting is all about timing! Recently, many scientific and medical studies have pointed to the benefits of intermittent fasting, from its weight loss results to its impact on disease. Not only does intermittent fasting help you lose those stubborn pounds, it can increase your energy, help produce good gut bacteria, reduce inflammation, eliminate sugar cravings, and boost mental focus. But to reap the full benefits, you have to do it right. With The Everything Guide to Intermittent Fasting, you’ll learn all you need to know to start safely incorporating intermittent fasting into your everyday life. This accessible and practical guide includes information on the different ways to fast, when to eat, why fasting benefits your body, which foods to eat to help you feel your best, and can help you determine which intermittent fasting plan best suits you. Featuring 100 recipes for nutrient-dense foods that will keep you full longer, and including tips, techniques, and advice from registered dietician, Lindsay Boyers, there’s never been an easier way to look and feel your best.